I’ve often been asked, “Why do you go to the Caribbean in the summer?” The answer is easy: winter is considered high season, therefore, summer is off-peak and rates are lower. Besides, island breezes usually blow cooler than temperatures in my hometown, St. Augustine, in northeast Florida. The real bonus, however, occurs at any time of the year: gazing or swimming in the crystal clear turquoise Caribbean Sea. I swear the water shimmers so vibrant you’d think food coloring was added. 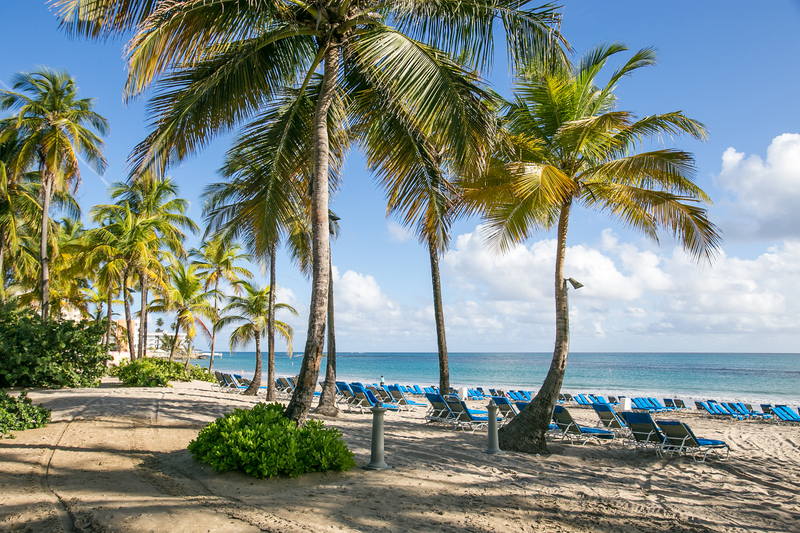 Getting to Puerto Rico is easy, as non-stop flights are often available (U.S. residents don’t even need a passport). So a quick getaway in San Juan sounded ideal to me. 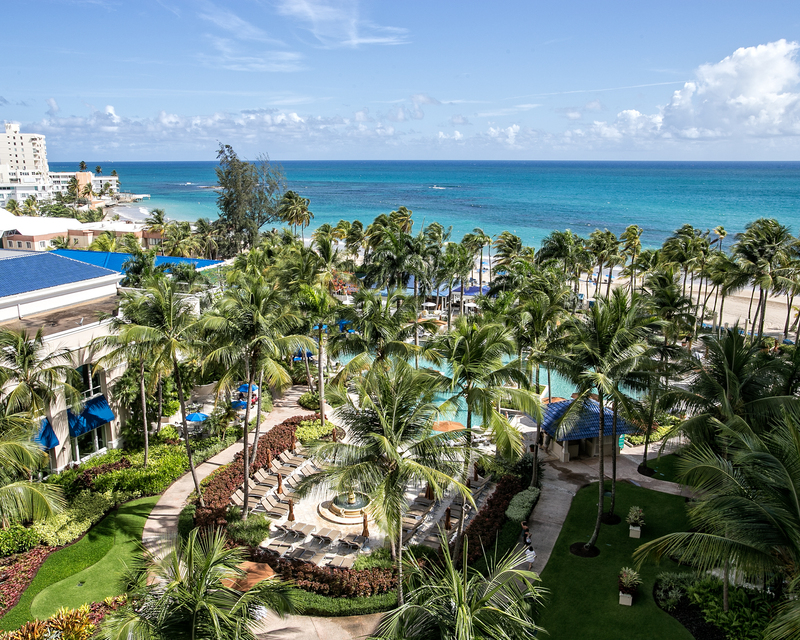 Once I landed in the capital city’s Luis Munoz Marin airport, I caught a taxi and five minutes later arrived at the front door of the Ritz-Carlton San Juan. Within another few minutes, the bellman greeted me and took charge of my luggage. I was welcomed at check-in with a mango Bellini (mango and champagne beverage) and escorted to my spacious room which overlooked the gardens and pool. As always, service at the Ritz Carlton ranked top notch. Not wasting any time, I pulled on my bathing suit, cover up and flip flops, picked up my book and I headed off to the Ocean Bar & Grill for a mojito and snack. This casual restaurant sits between the beach and pool. Yes, life was good, very good. The hotel pool incorporates iconic Ritz lion statues, which, in this case, spew water from their mouths. 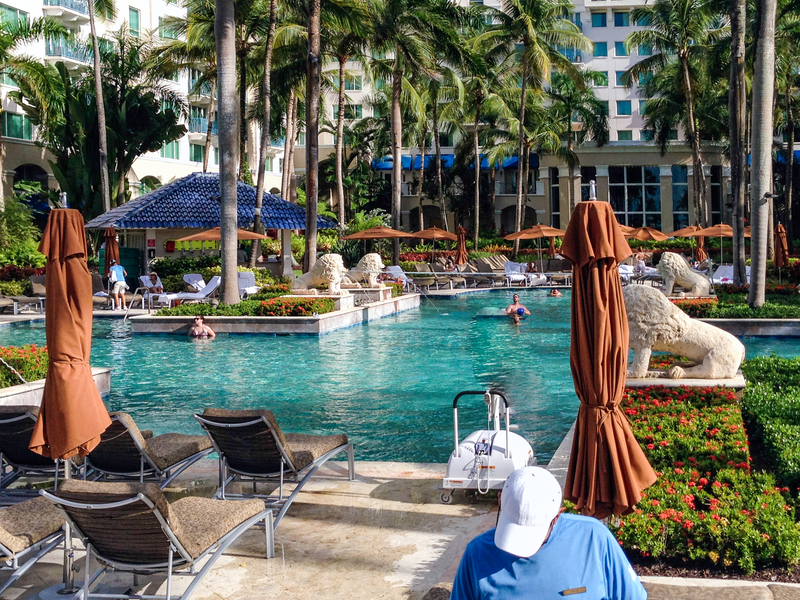 The irregularly shaped swimming area is partitioned by squares graced with live palm trees and ground cover. Urn-shaped planters are scattered about, brimming with cascading green foliage. Lounge chairs and umbrellas fill the deck and everything combines to create and encourage an atmosphere of refined, laid back fun. 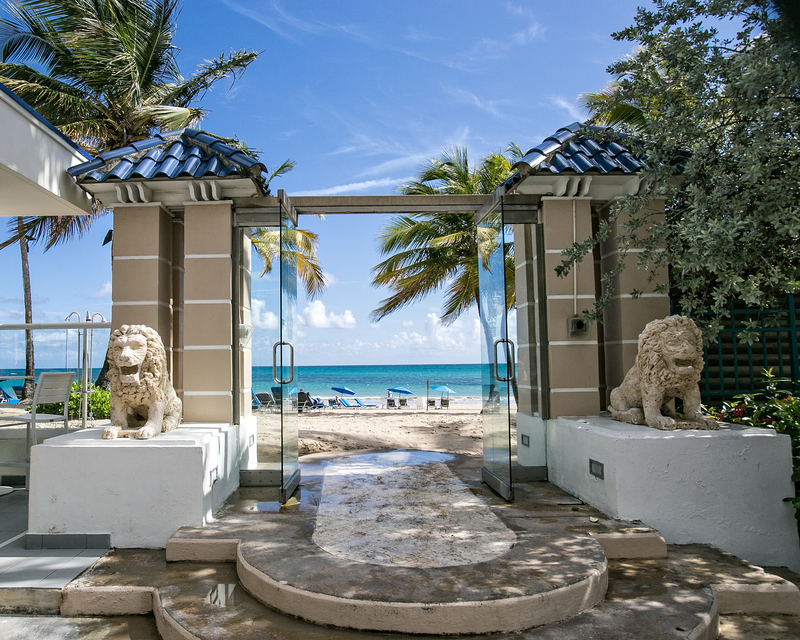 After a cooling dip, I walked between the beach gateway columns (naturally, manned on either side by lion statues) and stepped onto an eight-mile stretch of golden sand. 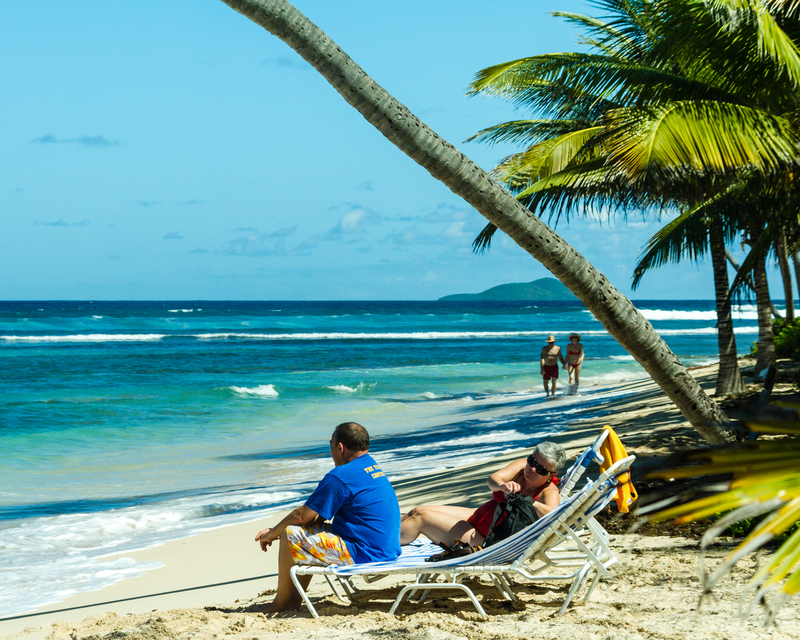 The hotel property includes two miles of manicured beachfront. Endless water and sky provide a treat for the eyes. Later, I returned to shower in my room’s airy marble bath, divided into three separate areas: toilet, double sinks/vanity and shower/bath. Wooden cubbies below the vanity promoted organized storage of my toiletries. I always appreciate hotel robes, and slipped into the monogrammed lightweight one provided, while drying my hair. All 416 guestrooms were renovated and refurbished in December 2011. Each bed is dressed with yummy Frette bed linens and goose down coverlets; luxurious and dreamy, in my opinion. The Ritz-Carlton Club features 46 guestrooms and suites accessed via key-activated elevator codes. Club room guests, may use the top-floor private lounge for complimentary beverages plus continental breakfast, light lunch, hors d’oeuvres, cordials and truffles. A concierge remains available for assistance. I headed off to the Old City for dinner. San Juan National Park rests in the historic area and includes two forts built by the Spaniards. They are UNESCO World Heritage sites. 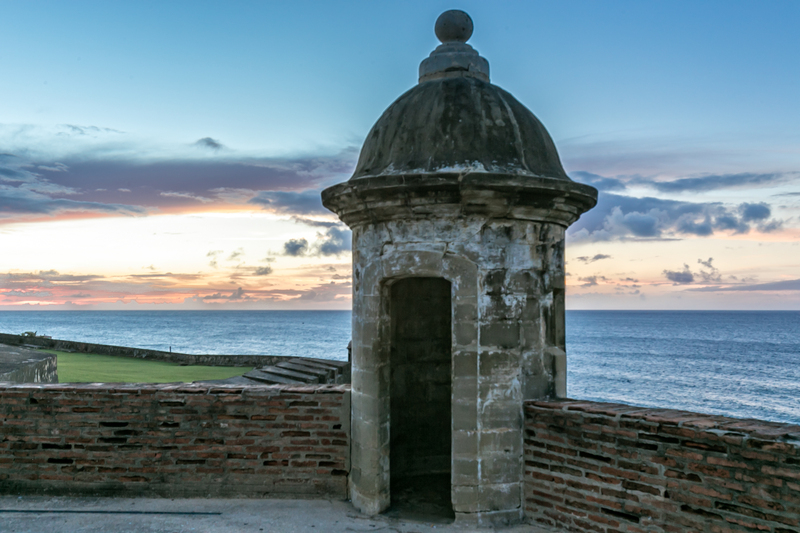 Castillo San Cristóbal helped guard the city from land attacks, while Castillo San Felipe del Morro guards at the entrance to the San Juan Bay. These are well worth a visit and reminded me of the Castillo de San Marcos in St. Augustine. While I was out for the evening, housekeeping came in and refreshed the bathroom and turned down my bed. I noticed the pool area radiates with a subtle glow, as both water and statuary are illuminated at night. Next morning, I toured the elegant white marble 12,000 square-foot spa, with 11 treatment rooms, steam rooms, sauna and whirlpool areas. It’s everything you’d want and expect for pampering, complete with fitness center nearby. I didn’t have time for a massage because I wanted to explore the island. Puerto Rico is among the top 10 places worldwide to see a rain forest. El Yunque Tropical Rainforest is the only tropical rain forest in the U.S. National Forest system. 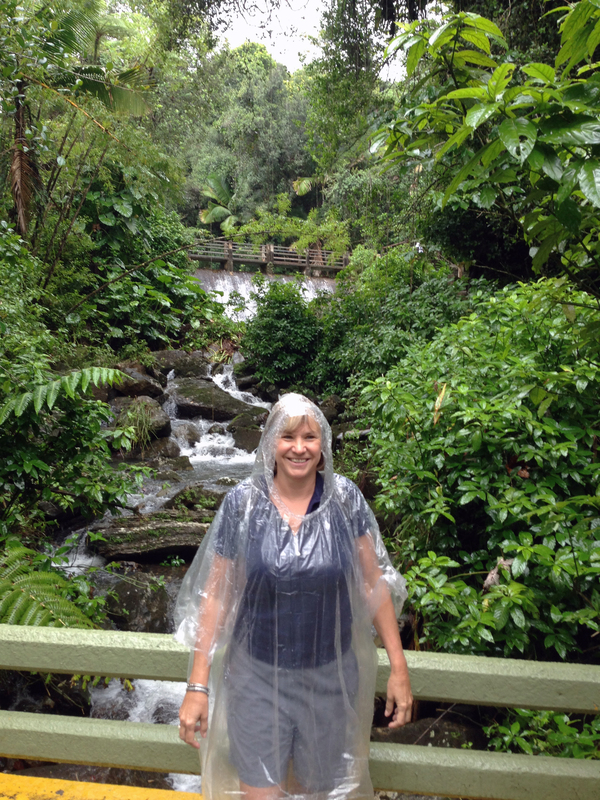 I was supposed to go on a guided hike, but as is common in a rainforest– there was rain, heavy rain! I saw only one of many scenic waterfalls and heard the sounds of the Coqui, the song of resident tree frogs. I missed catching a glimpse of the Puerto Rican Parrot, an endangered species only found there. The Visitor Center shows a worthwhile introductory film. 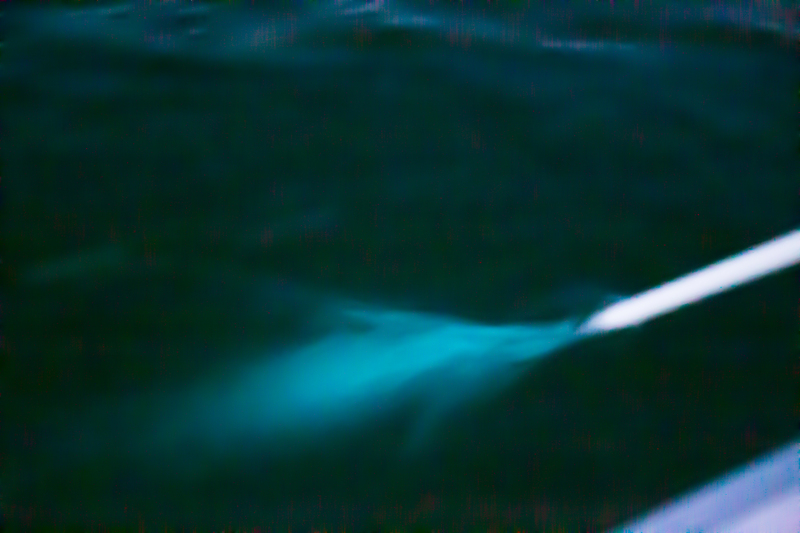 the water with an oar and see bioluminescent dinoflagellates living in the bay. It’s very cool! I was pleased I’d taken the electric boat tour for this nighttime excursion. The boat passed many kayakers struggling to paddle through dense mangrove lined channels in the dark. After a long day, I was too tired for gambling in the Ritz Carlton Casino. I retired and fell asleep in that oh, so comfortable bed. Alas, next morning was time to go home. Puerto Rico offers many natural, historical and culinary treats for tourists and I whole heartedly recommend the Ritz Carlton San Juan. All photos copyright @Debi Lander. My stay at the Ritz Carlton was sponsored by Meet Puerto Rico. However, my opinions are honest and my own.